We’re a married couple who are traveling the world, experiencing local cultures, and sharing our ideas on how you can do the same. 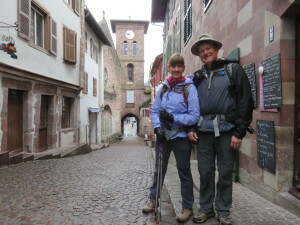 We started with a hike across Spain on the Camino de Santiago–The Way of Saint James. Dennis also used that trip to research the sequel to his new book, The Last Apostle. Since then we’ve lived in Portugal, Ireland, Scotland, England, Germany and Chile. We like to become part of communities. When we were stationed in Germany at Sembach Air Base we chose to live in a house in the local village of Winnweiler rather than on base. We plan to do that in our new life where we can–connect with people and places rather than just see the sights and pass through. Join the conversation. We’d love to hear your suggestions and field your questions as we spend our life on the road abroad and in the USA. Here’s a short video of our Camino trek. See our Camino page for a longer version.